So-called coworking spaces are said to be pioneering new ways of transferring knowledge and collaborative working. To what extent, however, can libraries, as the traditional places for the imparting of knowledge, benefit from this new approach? To find out, read this interview with Uwe Nüstedt from Wolfsburg Municipal Library and Christian Cordes who works at a coworking space. Mr Cordes, what do people understand by the term coworking space? A coworking space is a place where people can share a certain infrastructure and resources, be it the actual physical workplace or a WLAN connection or maybe a printer. The more important aspect, however, is the fact that they become part of a community in which they profit from the knowledge of the other members, in which they support each other and this, in turn, is beneficial for their own individual work. Coworking is for me a movement that is based on five fundamental values: community spirit, collaboration, diversity, openness and sustainability. Mr Nüstedt, haven’t libraries in fact always been Coworking Spaces? Nüstedt: Libraries have always been places where people get together, meeting places that were used for working together. Nevertheless I still see great differences when it comes to the current form of coworking. At the moment libraries are still priding themselves to a relatively great extent in the fact that they are providers of media, whereas the modern idea of coworking is of a very different nature – it is all about exchanging knowledge. Cordes: At the moment I personally see considerably more differences than commonalities. In the end coworking is focused on setting up a community, i.e. on establishing soft skills. Libraries are in the process of adapting their product to the requirements of the digital society. That is why I am a little cautious about using the coworking and collaborative workplace label. Despite all the differences coworking spaces and libraries can actually benefit from each other. After all, you, yourselves, cooperate with each other? Nüstedt: Yes, a short while ago we at Wolfsburg Municipal Library had the idea of holding a kind of get-together event for smart phone owners that would provide people with information on how to use these mobile devices. It did not take long before a cooperation project came about between the media centre and Christian Cordes of Schiller40 Coworking Space in the Kulturwerk of the city of Wolfsburg. In the meantime the event has become firmly established and is a real plus for the staff of the library. Every time I go to it, I, too, always learn something new. Cordes: The most decisive factor for me about the cooperation project with Wolfsburg Municipal Library was the fact that it was developed with people’s needs in mind. It was not commissioned by anybody, there was no program, the cooperation came about in a very natural way, so to speak, from the intrinsic motivation of all the people involved. Incidentally I think this is the only feasible way of enabling all the parties involved to benefit from each other in a useful way. This was the basis for developing a concept from practical experience. I feel one ought to be careful about imposing pressure on libraries in the name of innovation, something that maybe for absolutely fundamental reasons they cannot afford to do. Just because libraries provide a certain infrastructure and resources does not automatically make them modern venues for collaborative working. A library’s main focus is on the provision of media and information and is very different indeed to the way a coworking space works. Do you also see it like that, Mr Nüstedt? Nüstedt: Mr Cordes is of course right about one thing – we still have a lot of development work ahead of us. I do, however, believe that our focus in future is going to be more and more on the imparting of knowledge. For example, when it comes to new information technologies, the task of the library would not just be to discuss the opportunities and risks in a relatively abstract way, as it is already happening today, but rather to firstly obtain the devices in question and then give library staff the opportunity to experiment with them. To what extent will the skills of librarians have to be developed for them to keep up with the demands of the new technologies? Nüstedt: One thing is clear – the new role of libraries is that of a knowledge provider and if we are to aspire to individually advising people who come to us in our new role, we then have to think about the increasing demands put on library staff. This will require them to be communicative, curious and basically open to all things new. In future the media education aspect is also going to be more and more important. I do, however, also see the possibility of models in which the responsibilities are divided. We should think of libraries as open enterprises, in which media educators, for example, also play an important role. Now there is even talk of projects that envisage cooperation projects between libraries and start-up networks. What do you think of that idea? Nüstedt: In principle I find it interesting, although I still think there would be a lot of development work to be done on the part of the library. I really can’t imagine that happening soon, the way the framework conditions for libraries are these days. Cordes: I am afraid I am a little more sceptical about the whole thing. Ultimately it would mean competing with the traditional forms of economic development. When it comes to concrete questions about start–ups, even coworking spaces, whose structure is already geared to functioning as early incubators of business models, seem to be stretched to their limits. 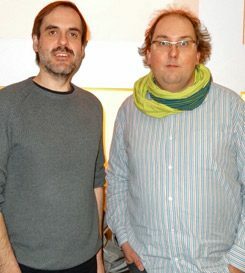 Uwe Nüstedt (left) and Christian Cordes | Photo: © Private Uwe Nüstedt (left) is a public relations officer at Wolfsburg Municipal Library and a “future-maker” at the Zukunftswerkstatt network. Christian Cordes is from Schiller 40 Coworking Space in the Kulturwerk of the city of Wolfsburg. He is spokesperson for Coworking Initiative Deutschland, the umbrella organisation of Coworking Spaces in Germany.